A delightful book, fun to read, but also lots of really good information about longleaf pine ecosystems. The longleaf pine ecosystem may be the most diverse in North America because it combines aspects of prairie with an open forest, all of it created and maintained by regular fire, hence the title “Painting the Landscape with Fire.” Mr. Latham does an excellent job of explaining how and why this is true and often does this with interesting anecdotes and information from boots-on-the-ground participants. Longleaf pine ecology once dominated large areas of the American South. Today, they tend to persist on poor soils like sand hills, leading some to assume that these are the sorts of sites longleaf prefer. More likely, they are the sites left to longleaf, places hard to log or unattractive for agriculture. The initial decimation of the longleaf ecosystem came when the piney forests were exploited for turpentine production and timber. They did not return because longleaf were often replaced by easier to establish loblolly pine forests and because fire was excluded. 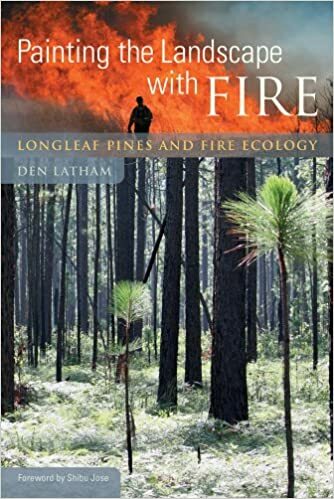 Without frequent fire, longleaf will lose in competition with hardwood species and loblolly pine. A particularly strong and persistent competitor is the sweet gum. Fire tips the scales in favor of longleaf. Longleaf seedlings can tolerate fire that will kill loblolly, hardwoods and various brush. Longleaf has a unique set of adaptation. The seedlings are largely immune to fire. They grow a sturdy root system before growing up. They look like grass for a couple years and grow little above ground. In the grass stage, they are largely immune to all but the hottest fires. All at once they transition from the grass stage to the rocket stage. They might grow six feet in a single year with few or no branches along the way. This protects the terminal bud from many fires, since the fire can burn the stem, but there are no big branches to carry the fire to the living and growing top buds. Unfortunately, fire use is declining, usually for liability and/or pollution control reasons. Professionals do not use the term “controlled fire” because no fire is 100% under control. They prefer the term “prescribed burns.” Any fire can get out of control and there are liability issues. These are becoming worse as there are more people building cottages, cabins and even houses in what used to be large expanses of forests. This human habitation also impacts from the pollution point of view. Where there is fire, there is smoke. Nobody likes the smoke and it may cause problems for viability and health issues. Then there is the problem of carbon release. This is not really the issue it seems, but perception is as important as reality. Carbon from a burn will not in the long run be a net carbon emission. One reason is that the forest will burn sooner or later and if not in a prescribed way, in a worse one. Even if it does not burn, the litters will decompose, releasing carbon. Beyond that, green vegetation comes back quickly and stronger after a burn. By the end of the growing season, the area will be green and lush. More important, the fire burns above ground. Much of the carbon is below ground or in the tree trunks not burned. Regular fires actually sequester MORE carbon in roots and soils. It is hard to believe this when you see the smoke, but regular fires are helping to sequester carbon, not emit it. Land managers and owners need to make some trade-offs. The longleaf takes a little longer to establish compared with loblolly. Longleaf wood is better quality, but the longer growing time is a consideration to humans who know they may not live long enough to benefit from the longer rotation. In a natural setting, longleaf live a much longer time than loblolly. Longleaf may live 400 years (the oldest known was 462 years old when the book was written in 2013). Loblolly is lucky to be robust at the century mark. There is a good chance that longleaf will be reestablished across its range, but it will never again achieve its old distribution. Interesting side note, forests in the American South owe much of their existence to the boll weevil. If you looked out over a tidewater landscape in South Carolina in 1910, would see mostly fields with just a few shade trees. Weevils, among other factors, made field agriculture less profitable and trees returned. Longleaf returned less than it might have because of the exclusion of fire, mentioned above. In the early days of the Forest Service, they campaigned against fire and succeeded very well. In a landscape painted by fire, taking that off the pallet changes the art. “A Landscape Painted by Fire” is an excellent and informative book. I recommend it to anybody interested in ecology, restoration and naturalism in general.